‘soundfruuze’ is an exprerimental live sampler / looper / granular and FFT scrub effect. It records live audio (10 seconds) and allows you to manipulate it with special controls. Most basic lane type. You can control the volume of the resulting sound and smoothness of the position interpolation. Lesser smooth value produces the sound with more high frequencies. Allows you to select the sound at some position and use both horizontal and vertical coordinates of touch as 2 independent parameters. You can control volume, playback speed (pitch) and the grain size. This type of lane is very similar to granular freeze but it allows to change the position of the grain after its start. In both FFT types of lanes another algorithm is used to process sound. In both FFT Freeze and Scrub sound is analyzed with the FFT transform and divided into frames. FFT Freeze allows you to select the frame at the desired sample position and to play it making the sound “freeze” at this point. This lane type allows you to make loops / repeat large grains of sound. When you touch a looper lane, a new looper control is created and is kept there until you turn it off with the red ‘close’ button. 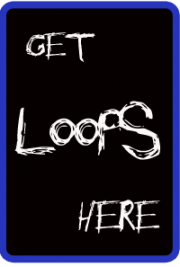 You can change loop speed, volume, size and position for each loop individually or for all loops on one lane together using additional controls.